MANILA (UPDATE) - President Rodrigo Duterte on Thursday said the United States appears to be courting him by expressing support for the Philippines’ military modernization program, after Washington expressed concerns over Manila’s plan to secure military equipment from its rival, Russia. Speaking before soldiers in Davao City, Duterte read a letter supposedly from US Secretary of Commerce Wilbur Ross, Secretary of Defense James Mattis, and Secretary of State Mike Pompeo, which sought to reaffirm Washington’s “strongest support” to modernize the Philippine armed forces. The President said the three secretaries sought more dialogue with his government on defense equipment procurement. “The US-Philippines alliance is an enduring partnership, built on shared history and values. This special relationship will only grow stronger by increasing our dialogue especially on security cooperation and trade,” Duterte quoted the three secretaries as saying. The President said the three secretaries boasted that the US is “peerless” in the world in terms of providing state-of-the-art military technology and has gained a reputation as a reliable partner. The President said the three secretaries “hope to partner in other significant defense procurement” which are mutually beneficial. 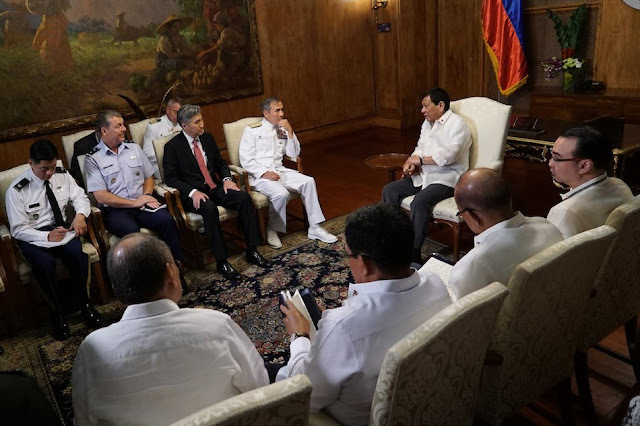 “We hope you share our view that our nation, the selection of a US partner for these future defense procurements, is mutually advantageous and strategically important to strengthen and deepen the steadfast bond between our [countries],” the secretaries said, as quoted by Duterte. He said the US will need to do more to prove its sincerity, especially after Washington suspended an arms sale to the Philippines after a US senator voiced concerns over the human rights situation in the Philippines. “How sure are you that I will get what I ordered? If I bought a dozen M16 [rifles], will they deliver them?” Duterte said. Duterte cancels assault rifle deal with U.S. The letter comes just as Washington raised concerns about Manila’s plan to get military hardware, including submarines, from Russia. While on a visit to Manila, US Assistant Secretary of Defense for Asian and Pacific Security Affairs Randall Schriver had warned the Philippines against acquiring military hardware from Russia, one of Washington’s rivals. Schriver’s statement did not sit well with Duterte, who has long been harboring a grudge against the United States and has turned to Russia and China for aid. Russian Ambassador to the Philippines Igor Khovaev, meanwhile, said other countries should respect Philippine-Russian ties. The President has been lamenting that the US sells or donates refurbished military equipment to the Philippines, while China and Russia offer brand new ones and without conditions. The US has been a primary source of military equipment for the Philippines, being a long-standing ally. But US criticism of Duterte’s human rights records have soured ties between the two sides.